According to the latest press invite that Vivo has just sent out, the Chinese smartphone maker is about to launch a brand new selfie-focused handset on September 7, 2017 sporting a near bezel-less screen design. 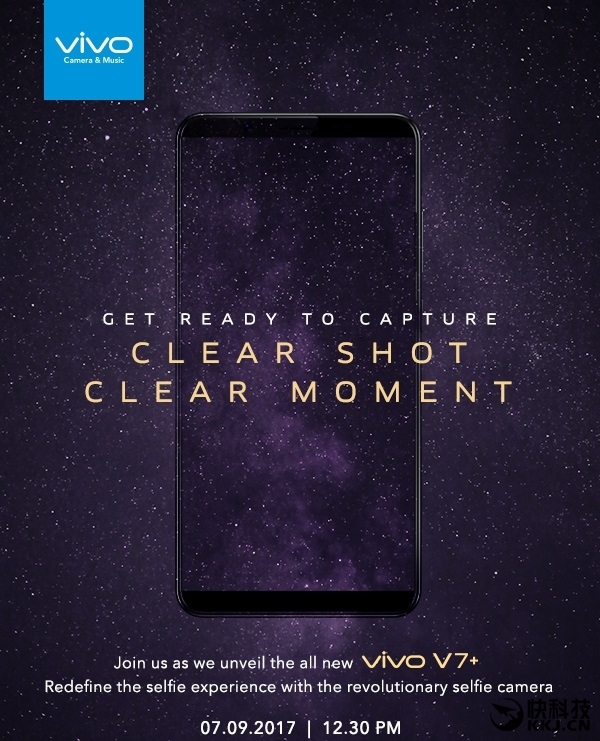 The device is to be called Vivo V7+ as per invite accompanied by slogans "Get Ready to Capture Clear shot Clear moment." And while Vivo still focuses on the selfie game, it appears in the invite that they will also introduce a new design that seem to be the new trend now in the smartphone scene - an edge-to-edge or near bezel less display. LG calls it FullVision with their G6 and Samsung refers to it as Infinity Display on their Galaxy S8, S8+ and Note8 smartphones. Based on the photo above, it looks like Vivo has already gotten rid of the physical button on the front panel right below the display that usually houses the fingerprint scanner. Now the question is, has it been relocated to the back? or has been completely removed from the device and the fingerprint scanner now embedded in the display panel? Whatever that is, we will know on September 7 at its launch event in India. However, rumors and leaks have a lot to offer as to what we can expect from this selfie smartphone. For example is its front or selfie camera, unconfirmed reports claim it to be pegged at 20MP + 8MP combination while the rear camera to be at 16MP. See other speculated specs list below. Since this is going to be a direct follow up to V5 and V5 Plus series that was also released in the Philippines, we hope that Vivo will also bring this new phone in the country in the near future. And let us also hope that it will be priced very competitively once reached the Philippine stores.